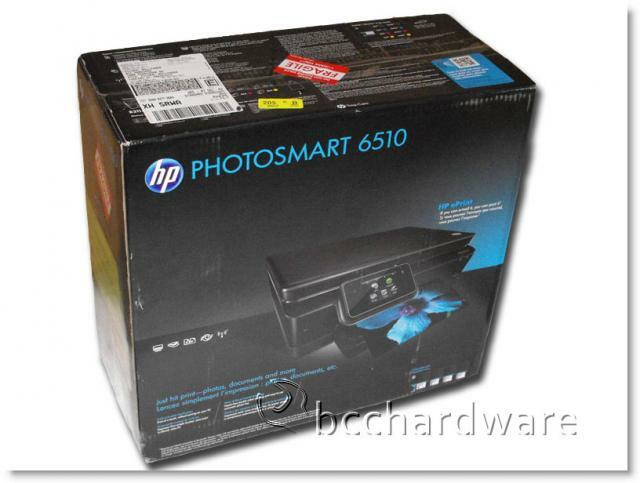 Today we have a brand new product from HP (Hewlett Packard) - the HP 6510 e-All-in-One Photosmart printer. This little unit can scan, print and copy any document or picture that isn't larger than a no10 envelope. Although they call it an All-in-One, it doesn't do faxes! So this is really a Mostly-in-One. It can even print directly from your camera's memory card. The beauty of this printer is that it can do all of this without even being physically connected to your PC. We will definitely get into that a little later. I think almost everyone has heard of HP. They manufacture all kinds of products that cover anything from laptops to printers and almost everything in between. The eAll-In-One 6510 is part of their Photosmart line and sits right smack-dab in their mid-range. You can spend a lot more or a lot less and still get the same basic features. We're going to find out how this one adds up. I was expecting to open the box and find the printer wrapped in plastic and Styrofoam, but to my surprise it wasn't. It was protected by some fiber-board on the ends and was wrapped in a canvas bag that doubles as a carrying bag. I'm not sure how much you'd actually carry around your printer, but I guess HP figures this is so awesome that you'll be packing it everywhere. 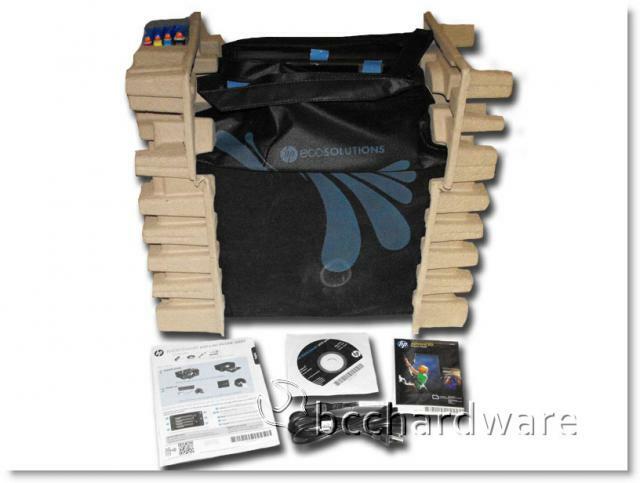 As you can see from the picture below: the shipping box is covered in photo quality graphics. After you remove the printer from the box you will find everything you need to get started - with the exception of a bundle of paper or a USB cable as you can see from the picture above (right). The bundle comes with four ink cartridges, a power cord, software CD, a multi-language users guide and a few pieces of photo quality paper. Once I have removed all the shipping protection removed the first thing that caught my eye was the 3.5 inch touch screen. 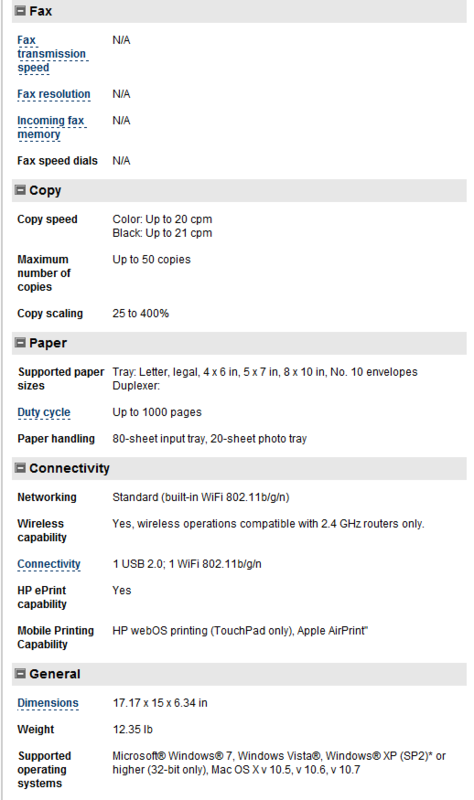 It's something I haven't seen on a printer before and HP has gone this direction in a big way. Nowadays it seems that about everything has a touch screen on it. The addition of a built in card reader is a nice feature as well. On the next page we'll cover the features and specifications before we jump into testing. 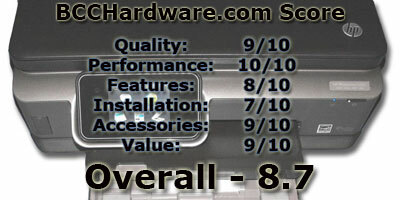 The following features and specifications were taken from the HP website and posted below for your convenience. As always if you want more information, please check out the manufacturers site for all the details, deals and everything else you need to keep your printer rocking! Kick your photo printing experience up a notch with premium features including a large touchscreen and automatic photo tray. Our Photosmart 6510 e-All-in-One is efficient for everyday printing and lets you wireless print and share, plus you can print on the go with HP ePrint. 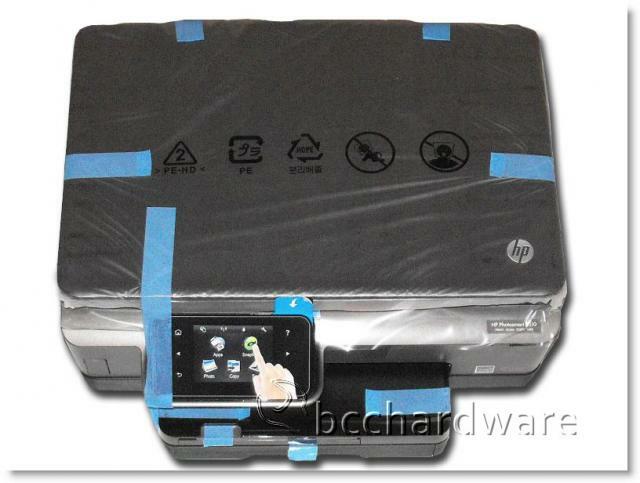 Once you get the HP 6510 e all-in-One printer out of all its protective gear, you can see its very well built. The first thing I noticed was the 3.5inch touch screen control panel. The touch panel is mildly adjustable as it can tilt from 45° to 90°. Regardless of where you position the printer, the touch screen should be easily visible and readily accessed. The next feature that caught my eye was the built-in card reader. It is positioned in a great spot - the left front corner and is covered by its own little door. After my initial inspection, I plugged up the power cord and prepared to go through the set-up. The set-up contains two parts; one part is setting up printer itself and the second part is getting your PC set-up to run the printer. The printer has software on it pre-installed to get it up and running. You have to install a software disc to install to get your PC up to speed. The first thing you're going to do is to get the printer ink cartridges installed and ready to go. 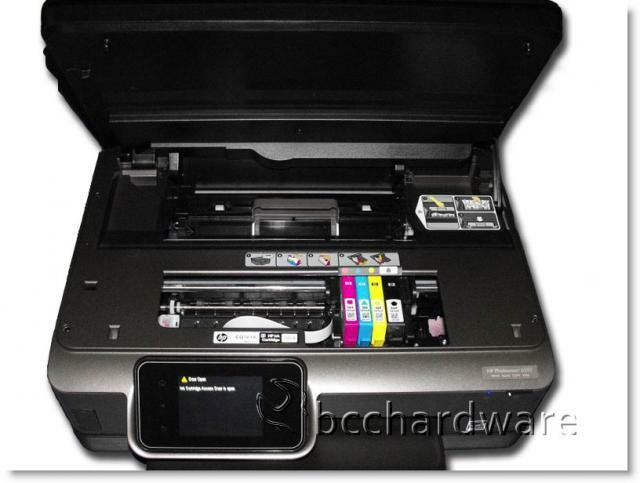 You have to actually have the printer powered up in order to install the four in cartridges. When you open the ink-cartridge door, the printer bar will move into position to install them. After removing the plastic shipping guard from ink cartridge bay, it's very easy. Simply remove all the protective wrapping on the cartridges and install them in their color coded positions. After this is done it's time to run the set-up wizard on the printer. This is also very simple and easy to do. The set-up wizard will guide you through the initial set-up and you'll be ready to go in no time. The first thing the printer does is run a cartridge alignment sheet to let you know everything is lined up correctly. The user's guide definitely helped me keep everything in the right order. After you have gone through the printer set-up, it will stop at the wireless set-up screen and prompt you to install the software disk in your PC. Simply insert the software disk and run the set-up. It will install four programs. They are: HP Photo Creations, Shop for Supplies, HP ePrintCenter and HP Photosmart. We will get more into this software a little later. After all that is done, you can run the wireless set-up wizard on the printer. It will detect any wireless networks. Pick your wireless networks and you're good to go. The HP 6510 e-All-in-One Photosmart printer will make a connection to your network and then it will print you its Wireless Network Test Results. These test results will tell you everything you need to know about the printers' connection to your network. After everything is installed, it's time to try printing some test documents. The installed software makes this very simple. I just simply clicked on desired document and printed it. Once you are finished with that. 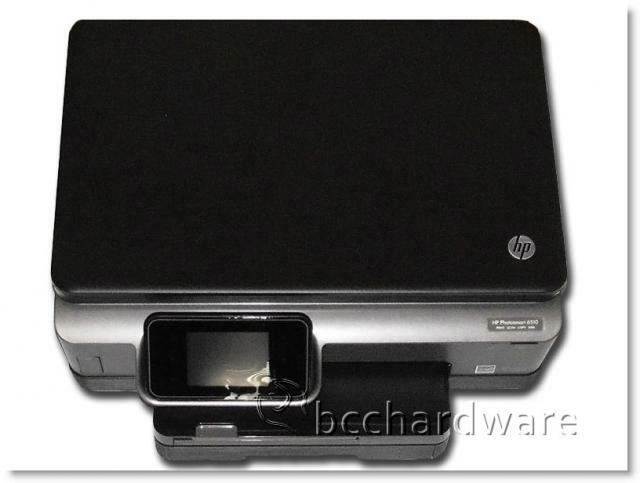 The HP 6510 e-All-in-One Photosmart Printer will have you do a test photo. This is also very simple. 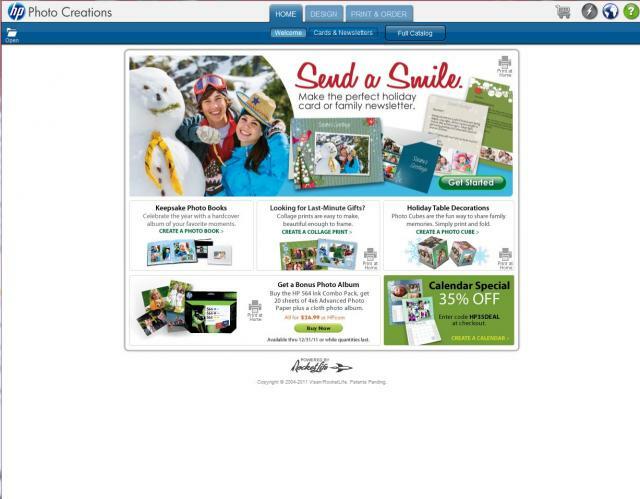 Pull up the desired photo and hit print. The only thing to remember is to load your photo paper face down. Scanning a document is very straight forward and this feature rounds out the set of the basic all-in-one. 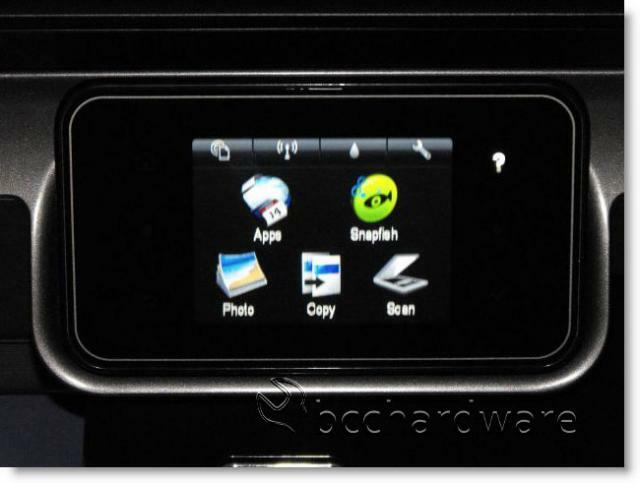 Place your document in scanner and hit the scan button on the touch screen. Copying anything is just as simple - place it in the desired position and make sure to line it up with the marks for paper size and then push the copy button on the touch screen. Once you have registered your machine with HP, you can set-up your email option. Their email option is an app called Snapfish. Once all that is done, you can email a document directly to your printer! That is a pretty awesome feature, but I did have a few problems getting this set up properly. On the next page we'll cover some software bits before we wrap things up. Now we can dive into the software more deeply. As I mentioned before, the installation CD for your PC will install four programs. 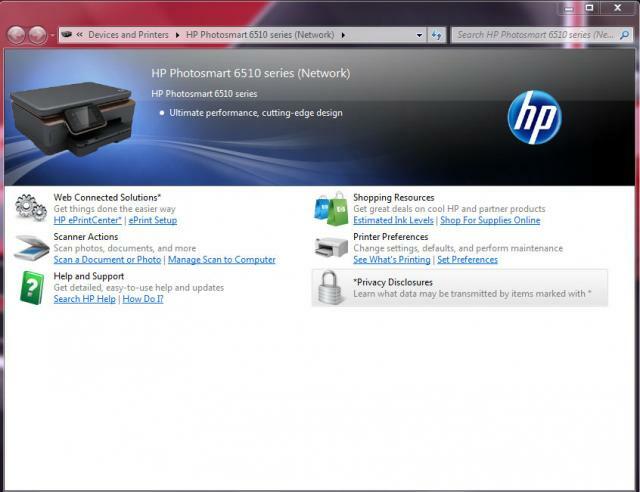 The main shortcut installed is the HP Photosmart 6510 Series. This is where you can access everything. There is also the Web Connected Solutions. 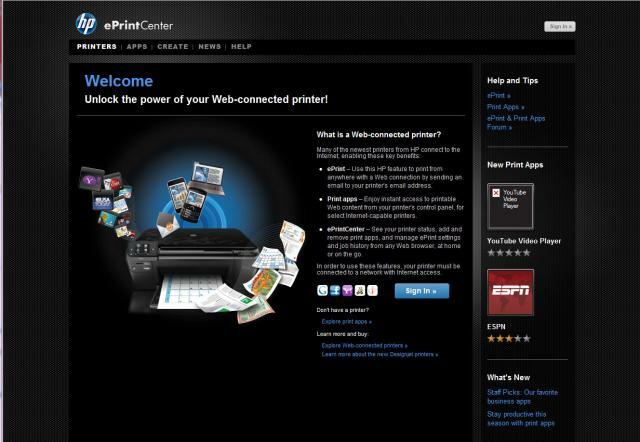 Here you can access the HP e-Print Center. Next up, we have Scanner Actions and this is where you find everything to do with the scanner. Finally, we end up at the Help and Support. Let's hope we don't need that too often. Next is The Shopping Resources and this is where you check your printer ink level and shop online for refills. Printer Preference and Privacy Disclosures round out the other options. As I mention the other three programs are actually more like links to web pages. In fact, I found some of them to be redundant since you can access them from the HP Photosmart 6510 Series shortcut. The only exception is the HP Photo Creations - this is where you can design things like cards and calendars. The HP 6510 e-All-in-One Photosmart printer comes ready to run. All you have to do is follow the directions on the touch screen. It took me a whole five minutes to complete the printer setup. Another interesting thing is that you can add apps to the printer touch-screen, if you find something you like. On the final page, we'll recap some details as we draw our conclusions. 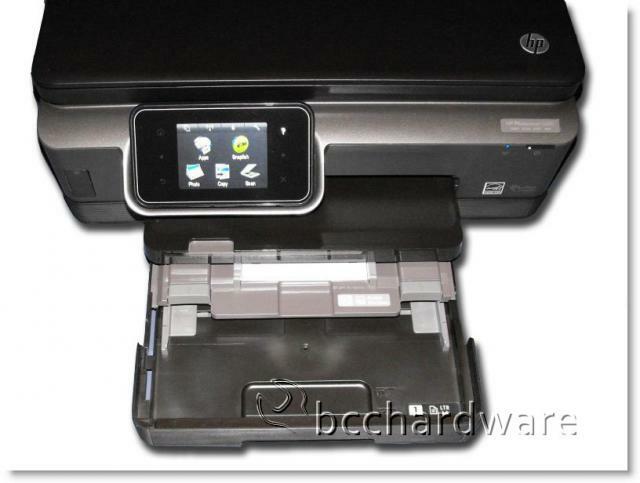 I found the HP 6510 e-All-in-One Photosmart printer to be a very nice piece of equipment to have around. 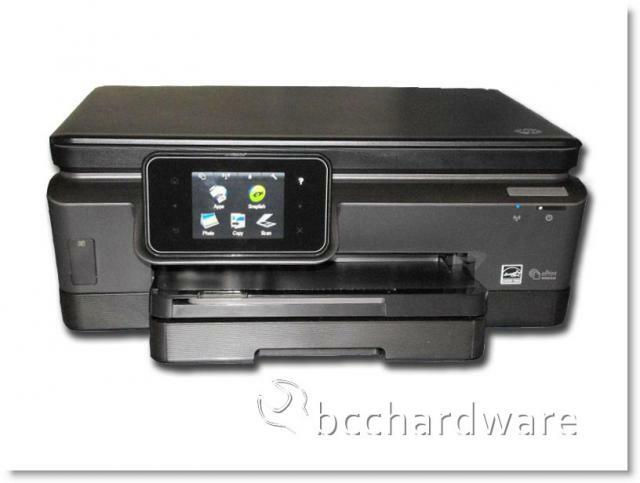 It is HPs newest offering in their line of ePrinters and hits the mid-price point perfectly. The ePrint series of printers don't have to physically connect to your PC, as long as you have a home network. The beautiful things is that this printer can be placed anywhere in your home - it doesn't have to be within USB cable length of a PC. That's what the ePrinter is all about. All-in-One means this unit can scan, copy or print. 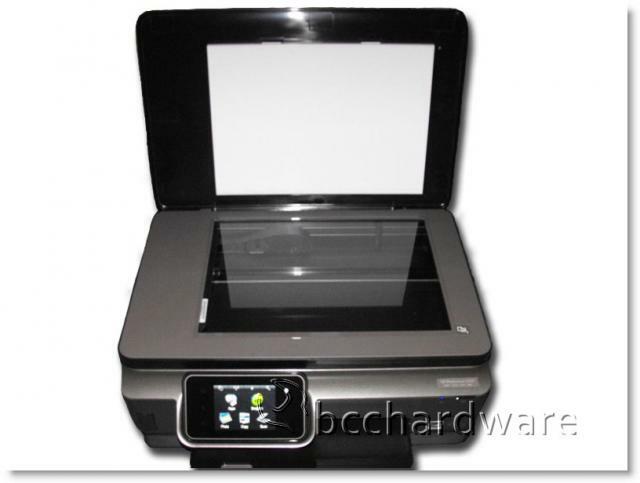 This printer is constructed from the usual material, but is well made and does not feel cheap. The addition of the card reader in the front is a very nice feature - a feature that most people will find invaluable. The HP 6510 e-All-in-One performed flawlessly throughout our weeks of testing. 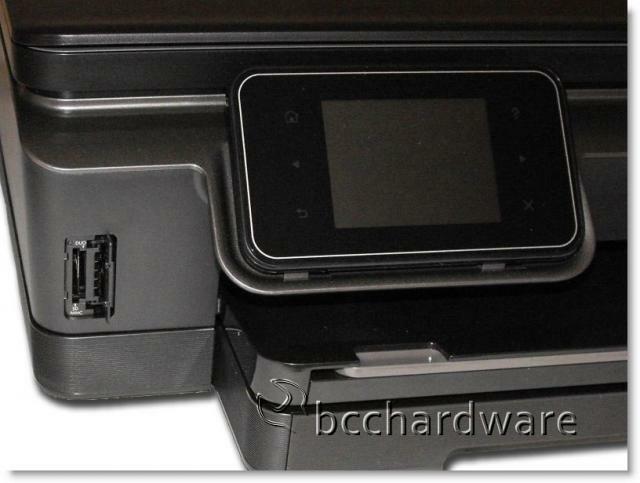 It prints a standard document in about 5 seconds; depending on your printer settings. The better the quality, the longer time it takes to process, but that should come as no surprise. Not only can it print on standard paper, it can also print on envelops, card stock, and makes borderless prints of your favorite photos. Scanning and copying documents is fast and painless. The email directly to your printer option is also very nice. This is great as it then enables you to print from any web-connected device. You don't have to figure out how to get drivers on your aging Windows Mobile 5 or 6 device - or figure out how to print from an Android phone - just email it! It will be there waiting on you instead of you waiting for it to print. Printing a picture takes a couple of minutes at high quality, but it's worth it. The HP 6510 e-All-in-One does a great job and ran circles around my old Canon All-in-One machine. The HP 6510 comes with everything you need to get started - with the exception of paper and a USB cable. It comes with a software installation disk, four ink cartridges, some photo quality paper to play with, a user guide and a power cord. I do think that for the $149 price tag, they could include a $1.99 USB cable to complete the accessory deal. The HP 6510 e-All-in-One comes almost ready to use. The printer it-self has its own set-up wizard that I found very simple to use. The 3.5" touch screen makes setup and use it a breeze. Just follow the on-screen instructions. The PC software, however, wasn't the easiest to use. It is a little confusing and redundant. It could have definitely been simplified. It's a printer, not the space shuttle. Although not entirely printer-related, I did have a few hiccups getting Snapfish to work. The MSRP for the HP 6510 is $149.99 in the US. I think that right in line with a printer that can do everything that this one can. It can be found @ Newegg for about $135, and after searching a few different web sites I found that the price of this unit is fair. Other manufactures that offer a printer with the same features are in the same price range. 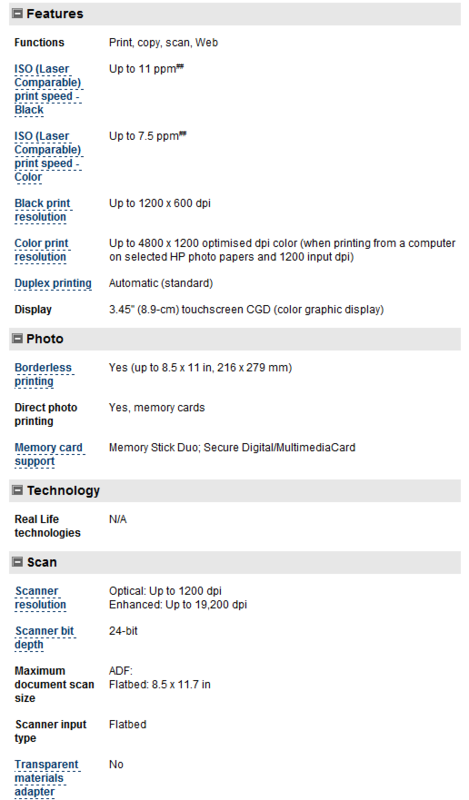 Overall, I found the HP 6510 e-All-in-One Photosmart Printer to be a very nice printer. It can print, scan or copy. It can print directly from you camera's memory card or from an email. This printer comes ready to use with minimal effort and confusion. A USB cable is not needed but can be used (if desired, and if you provide your own). In conclusion, if you are in the market for a printer that can do it all, the HP 6510 series would definitely be a great choice! 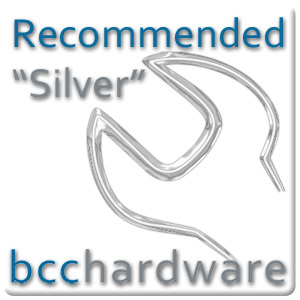 That's why it gets the "Silver Wrench Award". I would like to thank the people at HP for sending us this sample to review. I will look forward to seeing what they come up with next! If you have any questions, comment or general feedback feel free to leave them in the forum at the "Comments" link below.